Before I moved, my next door neighbor would always give me her Redbook Magazines when she was done with them. I loved finding that welcoming surprise on my doorstep once a month. I got my most recent drink idea from the last bunch of magazines she dropped off right before we left *tear*. Redbook featured three cocktails that are almost health foods because of the ingredients that you add. There was a ginger based cocktail with vodka and lemon, a green tea mixed with white wine, and finally, a very unique strawberry based drink. I didn't have all the ingredients for the first two, but I did for the strawberry drink. Muddle the strawberries, basil, and balsamic together in the bottom of a tin. After muddling, add ice, rum, agave, and lime juice. Shake vigorously and pour into a glass. Top with some club soda and enjoy! This drink was delicious with a little kick because of the balsamic vinegar. 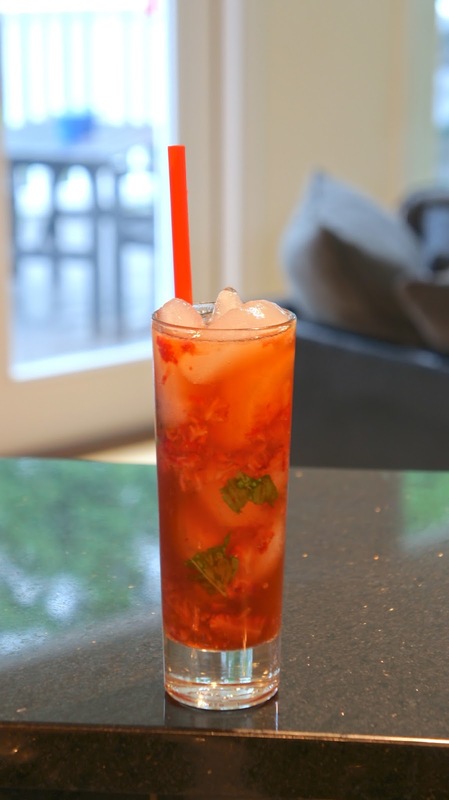 The strawberries and basil added a freshness to this adult beverage. Perfect for sipping outside on a hot summer day.